People from BAME communities are over-represented at almost all stages of the criminal justice process, disproportionately targeted by the police, more likely to be imprisoned and more likely to be imprisoned for longer than white British people. People from BAME groups are more likely to be stopped-and-searched than white British people. The disparity differs between different stop-and-search powers. In 2011, police were 28 times more likely to use ‘Section 60’ stop-and-search powers (where officers do not require suspicion of the person having been involved in a crime) against black people than white people. In the year 2013-2014 59 per cent of people stopped under Section 60 by London’s Metropolitan Police Service were either Black British or Asian British. Analysis of all stop and searches in 2014-2015, by StopWatch, indicated that people from all BAME groups are twice as likely as white people to be stopped and searched. Black people specifically are 4.2 times as likely as white people to be stopped and searched by the police. Stop and search practices are frequently ineffective. Around 86 per cent of the 539,788 stop and searches made in England and Wales from 2014-2015 did not lead to an arrest. There were 1.04 million arrests made by police in England and Wales in the year ending 31 March 2014. The overall number of arrests in this period decreased by 3 per cent compared to the year before and, within this, the proportion of arrests by ethnicity was identical to the year prior: 79 per cent of arrests were of self-defined white people, 8 per cent Black British people and 6 per cent Asian people. However, regional forces such as the Metropolitan Police recorded higher arrests of the UK’s BAME population, with 25 per cent of all arrests from 2013-2014 of black or Asian people. In 2014, black people were nearly three times more likely to be arrested than white people. Those from a ‘mixed ethnic group’were approximately twice as likely to be arrested than white people. According to Joint Enterprise – Not Guilty by Association (JENGbA), the joint enterprise doctrine (whereby people can be arrested and convicted of an offence, despite not having committed it, if they knew or are seen to have encouraged its act) is disproportionately used against BAME communities. Of around 500 prisoners JENGbA is currently working with, around 80 per cent are from BAME communities. Certain BAME groups are more likely than white groups to be sentenced to immediate custody for offences which can be tried in the Crown Court (indictable offences). 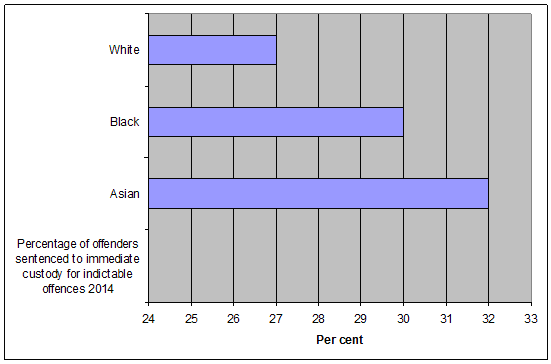 In 2014, 27 per cent of the ‘white group’ convicted for indictable offences were sentenced to immediate custody, 30 per cent of black people and 32 per cent of Asian people. A study in 2011, based on an analysis of over one million court records found that black offenders were 44 per cent more likely than white offenders to be given a prison sentence for driving offences, 38 per cent more likely for public order offences or possession of a weapon and 27 per cent more likely for possession of drugs. Asian people were 19 per cent more likely than white people to be given a prison sentence for shoplifting and 41 per cent more likely for drugs offences. BAME groups are significantly over-represented in the prison system, with approximately 25 per cent of the overall prison population from a BAME community. In 2014, black or Black British people made up 10 per cent of the total prison population, whilst making up just 3 per cent of the UK’s total population. Asian or Asian British people made up 6 per cent of the prison population. White British people made up approximately 75 per cent of the prison population, whilst making up over 85 per cent of the UK’s total population. According to the Equality and Human Rights Commission, there is greater disproportionality in the number of black people in prisons in the UK than in the United States. Foreign nationals are overrepresented in the criminal justice system. 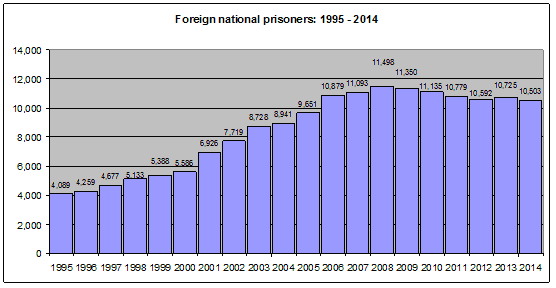 In 1995, there were 4,089 foreign national prisoners in England and Wales, and 10,834 in June 2014. Around the same time approximately 12.5 per cent of those in prison in England and Wales were foreign nationals. From 2013-2014 there were approximately 1,216 young people (excluding 18-year-olds) in the secure estate (young offender institutions, secure children’s homes and secure training centres) at any one time. Between October 2013 and 2014, the overall number of children in custody decreased by approximately 15 per cent. However, in the same period 22 per cent of young people in custody were from a ‘black background’, compared to 8 per cent the year before. 6 per cent of senior judges were from a BAME community. 8 per cent of practitioners in the National Offender Management Service (NOMS) were from a BAME community. 5 per cent of police officers of senior rank in England and Wales were from a BAME community.